There have been hundreds of Halo figures released over the last ten years, but despite advances in technology (allowing for greater detail and “realism”), they haven’t changed that much. Not until these interesting new figures from Kotobukiya, anyway. 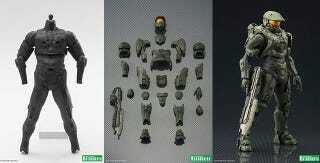 They’re called Halo Spartan Techsuits, and the idea is that instead of coming as a finalised, completed figure—all moulded from the same plastic—you start with the “frame”, or undersuit, then add the armour on yourself. They’re not model kits, you just clip them on. That way the armour’s actually sitting atop the suit, like it would in the “real world”, instead of being sealed into place. Looks pretty good! The figures will come in a few varieties: a couple of Master Chiefs, a Spartan Mark VI and a blank techsuit so you can swap armour around and design your own guy.